Across India there are feats of ancient engineering and architecture that marry form and function to such an impressive degree that even modern designers marvel. 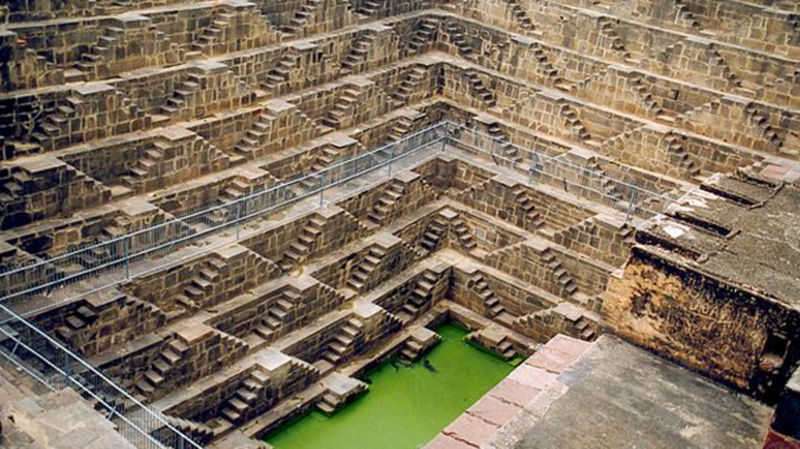 They're called stepwells, and you sometimes have to look underground to find them. The first stepwells were likely built around the 4th century CE and provided access to the water table for irrigation, bathing, and drinking. They contain, as you might have guessed, literal steps, sometimes descending as far as 10 stories. The stepwells were especially valuable in the dry states of Gujarat and Rajasthan, and, beyond water, offered a place of cool respite for weary travelers, and a place to congregate for villagers. More than just water sources, the massive subterranean oases (also called baori) display varying architectural styles from place to place. Among the reported thousands that were built, many also served as Hindu temples and places for spiritual bathing. Those stepwells contain ornate stone carvings, whereas Islamic-built stepwells feature more subtle adornments. In 1864, French writer, photographer, and traveler Louis Rousselet described the stepwells as "[a] vast sheet of water, covered with lotuses in flower, amid which thousands of aquatic birds are sporting." The stepwells fell into disuse during the British Raj, as modernization brought alternative means for accessing water. They were deemed unhygienic, and those that weren’t simply neglected were destroyed. Fast-forward to about three decades ago, when Chicago-based journalist Victoria Lauman discovered the often easy-to-miss stepwells while visiting India. She’s been championing them ever since. Lauman calls the structures an "endangered species" and in her documentation, has brought much renewed interest to the ancient wells. She has visited upwards of 120 still-surviving stepwells, and she plans to publish a book and a map about the landmarks. India’s present-day water crisis has also brought new interest to stepwells—so much so that the government has put forth an effort to preserve and even restore the cisterns, pulling them from their dilapidated state to revive a long-dormant role. Engineers are also looking back to the ancient architecture as they design new modular water-collection tanks, as CityLab reports. Lauman told CityLab, "In most cases, there's so little above-ground presence to alert you or prepare you for what you’re about to see. They subvert the notion of what architecture usually means. We look up at architecture, we look across at architecture, but rarely do we look down."